Surat, January 19: PM Narendra Modi, on the last day of its visit to Gujarat, inaugurated the Armoured Systems Complex (ASC) at Surat’s Hazira accompanied by the defence Minister Nirmala Sitharaman. The ACS has been developed by L&T to manufacture K-9 Vajra-T self-propelled Howitzer guns, the first private company in India to produce such a facility to manufacture the advanced high-end guns. 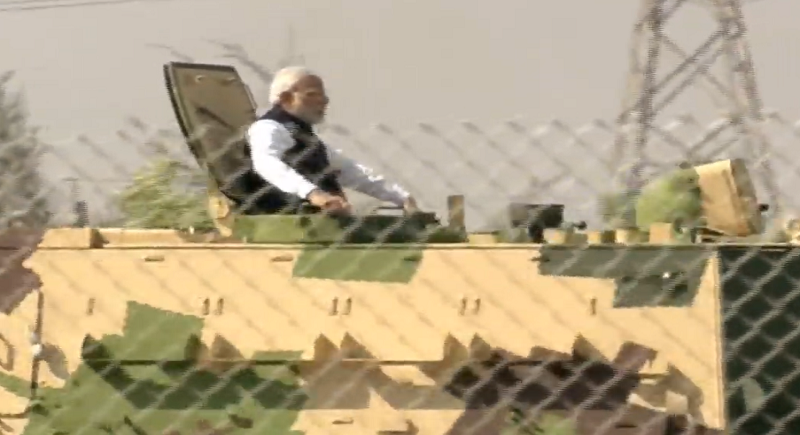 Arriving at the L&T unit, Modi visited the manufacturing plant of the guns. The company aims at serving the Indian army with 100, well equipped, Made in India arms and ammunitions, of which 10 are being given to the army after trials at Rajasthan and Gujarat. In July 2018, L&T had announced that it had entered into a contract with South Korea's Hanwha Techwin to jointly manufacture the K9 Vajra-T, a variant of K9 Thunder, which is inarguably the world's best 155 mm / 52 calibre self-propelled howitzer. “The L&T had signed a Rs 4,500-crore contract with the Defence Ministry in 2017 to supply 100 units of K-9 Vajra-T guns to the Army. The contract was part of the Centre’s ‘Make in India’ initiative. While 10 units have already been provided to the Army, production of the remaining 90 units is in progress”, reported the statement. The L&T has been manufacturing the guns in collaboration with South Korean company Hanwha Techwin. The gun is a variant of K-9 thunder and used by army in South Korea and other countries. Sources said that the K-9 Vajra-T has been manufactured to meet the requirements of 21st century warfare and will be an important asset for the Indian army. The gun has deep fire support system features with longer fire range. It had been put on display in a Defence Expo held in Chennai last year. In Silvassa later today, Modi will inaugurate and lay foundation stones of various projects in the presence of Silvassa administrator Praful Patel, BJP MP of Dadra Nagar and Haveli Natu Patel and several other BJP leaders. Foundation stones of 17 projects including Medical College in Silvassa, three English-medium primary schools in Dadra, Naroli and Khanvel, Integrated Water Management Project in Dadra, PM Awas Yojna, among others will be laid upright.